What Do Google And Gangsters Have In Common? Gangs are an important factor in the world’s underground economy, but they’re not just about selling drugs and breaking kneecaps. When run well, they have a lot in common with some of the world’s most successful companies. Misfit Economy Archetype: The Gangster. Motivated, loyal, seeks a sense of belonging and shows a willingness to take risk. Most often found in the black market. Tendency towards territorial behavior and likes to protect “turf.” Operates within hierarchical structures. Illustration by Tom Jennings. This story–one of the best scenes on The Wire (if you could ever choose a best scene on that show)–captures the essence of perhaps the most prevalent myth of innovation: that it comes only from those at the top, those within the closed doors of corporates, those within Silicon Valley startups and Ivy League research labs across the globe. Most, like the young drug dealer, still believe the engine of the economy is fueled by innovators working in the formal world and on the pages of Harvard Business Review. Our book, The Misfit Economy, is about dispelling this very myth. The “itch” to innovate is not an exclusive privilege of startup entrepreneurs from Silicon Valley. Innovation also comes from the ships of pirates, the underground world of hackers, the havens of Mexican drug lords and the enterprising underworld of Mumbai. Misfit innovators operating outside of the formal economy are a vital part of our economic history (think about Johannes Guttenberg or Nikola Tesla), and will continue to be a part of our economic future. By 2050, one-third of the world’s workers will be employed by the informal economy. In fact, if you combine the annual income of informal markets across the globe, it comes to a staggering $10 trillion. This magnitude means we simply have to care about this: Underground innovators have been ignored and misunderstood for too long. All he did was walk around and shake hands with people, spend money, drive nice cars, and party with his friends. Despite his fears, he accepts: “Did it really take a self-styled CEO to manage that?” He quickly found that it did. Throughout the day, the young sociologist was faced with one problem after the next. One particular issue: the sale of diluted crack from a few of his dealers. One of J.T.’s informants relayed to him that Michael, a dealer, was selling diluted product to take a bigger cut. J.T. asked Venkatesh what he would do if he was the gang’s boss and had to deal with Michael. J.T. explained it wasn’t that straightforward: “Most guys wouldn’t even think of these ways to make money,” he said. “Here’s a guy who is looking to make an extra buck. I have hundreds of people working for me, but only a few who think like that. You don’t want to lose people like that.” What he needed to do, J.T. told him, was to quash Michael’s tactic but not the entrepreneurial spirit that drove that sort of behavior. Does this sort of dilemma sound familiar? Not the crack part, obviously. But the part where every forward-thinking manager strives to create a culture of entrepreneurialism within his or her company. Consider Google’s now very famous 20% rule. As the company got richer, larger, and more hierarchical, it sought to maintain that enterprising feel every startup thrives on. So it continued to encourage that its employees spend 20% of their time working on their own ventures, most of which ended up becoming official and now indispensable Google products, like Gmail, Google Talk, and Google News. Of course in gang life, entrepreneurial spirit or the drive to “get ahead” can also be threatening to those in power. But is this not true of many corporate settings as well? The pursuit of recognition and esteem drives innovation, but can also be incredibly disruptive to organizations–whether you’re a black market innovator or a corporate intrapreneur. But there are also some notable differences between corporate and gang life. While whistle blowers in companies are deeply discouraged and often penalized, many individuals within drug gangs constantly face an opportunity to rat out their colleagues. And the odds are, the bigger the drug gang, the higher probability there will be a rat. For this reason, gangs have had to radically downsize in recent years to ensure loyalty. The art of loyalty is actually something Google knows a lot about. In an effort to better recruit and retain employees, Google is notorious for creating a “sticky” culture. The company is known for a culture of play and experimentation. Successful gangs are similar. They understand that culture is the number one value proposition they can provide members. The Latin Kings, for example, a street gang largely operating in the United States, celebrate Hispanic culture and members pursue Enlightenment and participate in cultural education in addition to a range of criminal activities. And just like many companies, the Latin Kings also went through a period of re-organization or re-visioning. In 1996, the Latin Kings went from being a street gang to a “street organization,” and developed a more mission-centric focus, becoming involved in political demonstrations while still maintaining its “sacred cows”: drug dealing, assault, money laundering, and identity theft. Not convinced? Well, we’re just getting started. Over the course of the next year, we’ll be posting regular stories from innovators we meet in the black market. Of course, we’re also open to suggestions of people to interview. If you know of any great misfits we should speak to, please write us at hello [at] misfiteconomy [dot] com. This piece was originally published in MakeShift magazine. 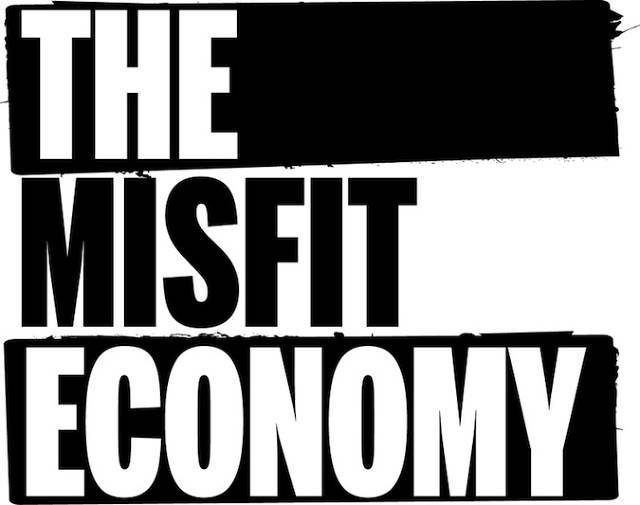 Check out ]The Misfit Economy site or follow them on Twitter and Facebook.